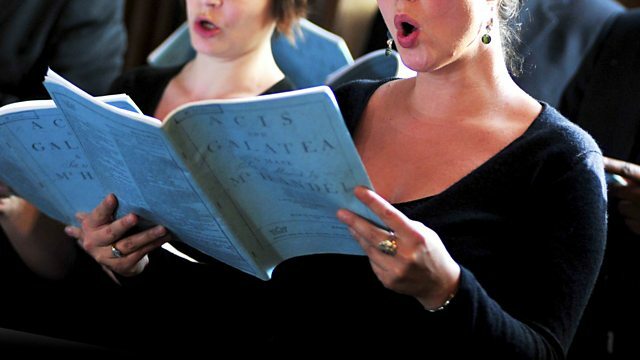 Programme exploring all things choral, including performances and special features. Choir: The Carice Singers. Conductor: George Parris. Singer: Suzette (Suzie) Leblanc. Singer: Daniel Taylor. Singer: Charles Daniels. Singer: Stephan MacLeod. Orchestra: Montreal Baroque Orchestra. Director: Eric Milnes. Choir: Rodolfus Choir. Director: Ralph Allwood. Choir: Ars Nova. Conductor: Paul Hillier. Singer: Elizabeth Connell. Singer: Amanda Roocroft. Singer: John Mark Ainsley. Singer: Martyn Hill. Singer: Maldwyn Davies. Singer: Anne Dawson. Singer: Linda Kitchen. Singer: Alan Opie. Singer: Gwynne Howell. Singer: Thomas S. Allen. Singer: Sarah Walker. Singer: Catherine Wyn‐Rogers. Singer: John Connell. Orchestra: English Chamber Orchestra. Conductor: Matthew Best.